Iris gave me Cooks Illustrated and I broke it in by making Chocolate Dipped Triple Coconut Macaroons. This cookbook is now my go-to, both for specific recipes and simple browsing... so much goodness in this kitchen staple. I made the macaroons on an afternoon when Ellis was running around with 2 of his friends, and served them for my birthday party. The best part about food is how it centers people. give them a try. they're not too sweet, not too sticky, and not hard to make- and they somehow impress. 1. Adjust oven racks to upper-middle and lower-middle positions and heat oven to 375 degrees. Line 2 baking sheets with parchment paper. 2. Whisk cream of coconut, corn syrup, egg whites, vanilla, and salt together in small bowl; set aside. Combine unsweetened and sweetened coconuts in large bowl; toss together, breaking up clumps with fingertips. Pour liquid ingredients over coconut and mix until evenly moistened. Refrigerate for 15 minutes. 3. Working with 1 tablespoon of dough at a time, drop dough onto prepared baking sheets, spacing them 1 inch apart. Using moistened fingertips, form dough into loose haystacks. bake until cookies are light golden brown, about 15 minutes, switching and rotating baking sheets halfway through baking. 4. Let cooking cool on baking sheets until slightly set, about 2 minutes; transfer cookies to wire rack and let cook to room temperature. 5. 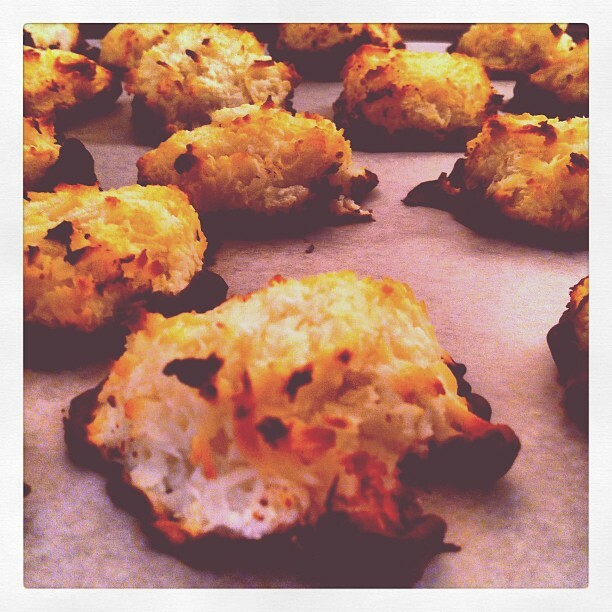 Cool baked macaroons to room temperature; line 2 baking sheets with parchment paper. Chop 10 ounces semisweet chocolate; microwave 8 ounces chocolate at 50 perfect power for 2 minutes. Stir chocolate and continue heating until melted, stirring once every additional minute. Stir in remaining ounces of chocolate until smooth. Holding macaroon by its pointed top, dip bottom 1/2 inch up sides in chocolate, scrape off excess, and place macaroon on preparing baking sheet. Repeat with remaining macaroons. Refrigerate until chocolate sets, about 15 minutes.